The Honorary Commander and Mission Partner Association held its fourth and final tour of the year Oct. 28 at Blackbird Airpark in Palmdale, Calif. The event brought military and community leaders together working toward the same goal, to educate the community about the role Air Force Plant 42 plays in the High Desert community. Dr. Will Laird, honorary commander for Plant 42, said it’s a role a lot more extensive than most people realize. Liard said Plant 42 has been the cornerstone of pioneering aviation and the event offered invited guests a two-hour bus tour that covered the grounds and introduced the facility’s mission partners. Among the partners are the three aerospace giants — Boeing, Lockheed Martin and Northrop Grumman. The National Aeronautics and Space Administration, more commonly known as NASA is also a mission partner and opened its doors during the tour. Visitors got a close-up view of SOFIA, NASA’s flying observatory and NASA’s Lockheed-built ER-2 aircraft, which operates as a flying laboratory used in NASA’s Airborne Science Program. 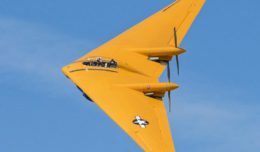 Boeing had its impressive F-15 on hand and Northrop proudly showed off the company’s B-2 bomber. “The most advanced aircraft was developed here,” Laird proudly points out. Laird, principal for Desert Winds Continuation School in Lancaster said the two years he served as the Honorary Commander and Mission Partner gave him an inside view on how all the entities work together, and gave him the chance to share that knowledge with students. “The experience gave me insight on what we should be teaching our kids, what we need to do to help prepare our young people for their future careers,” Laird said. AF Plant 42 is a government facility owned by Wright-Patterson Air Force Base in Ohio and operated by the tenant contractors. 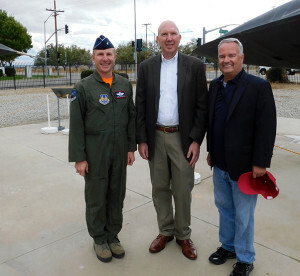 John Esch, director of Operating Location AF Plant 42, was on hand to oversee the Oct. 28 activities and praised the partnership among the tenant contractors and the Air Force. Karl Lewis, chief of media operations and plans MC’d the event and introduced military and community leaders and welcomed guests. He talked briefly about the facility’s capabilities and its contributions to the country’s national defense. Brig. Gen. Carl Schaefer, 412th Test Wing commander, welcomed everyone to the event and talked about the close relationship between Plant 42 and Edwards AFB. He praised the team effort between the military and its contractors. Alex Briskin, director of Plant 42, traveled from Wright-Patterson AFB to take part in the tour and greet guests. The Blackbird Airpark is open to the public 11 a.m.-4p.m., Friday, Saturday and Sunday.